Is This a Funny Birthday Card, a Numbers Trick on Age, or Both? Want to send a funny birthday card greeting to a friend that’s conscious about his or her age? 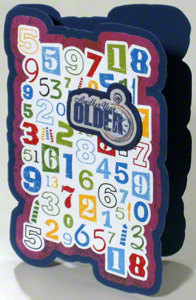 Then, use birthday card humor like this to play a numbers game without mentioning age. 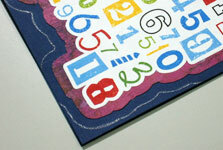 The coolest thing about this creative birthday greeting card is that it’s simple to make. 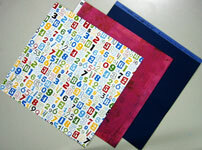 The main material is the paper with numbers art. Can’t find such a material? Then see the tips and tricks below for how to make your own. Want to add a funny birthday card message? 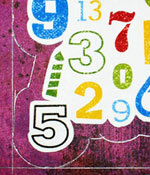 Use the pencil to trace out a silhouette around the edges of the numbers within a 4.5” x 7” imaginary box. Glue this cutout on the maroon abstract cardstock with at least enough material to draw a box of 0.25” margins all around. 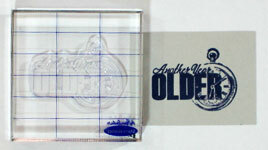 Maintain this 0.25” margin while using the edges of the glued cut-out as a guide to trace out a new silhouette. Cut out this silhouette on the maroon abstract cardstock. From the 12” x 12” dark blue cardstock, cut out an 8” x 11” rectangle. 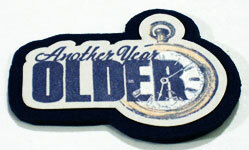 Score and fold this dark blue cut-out into a 5.5” x 8” card. 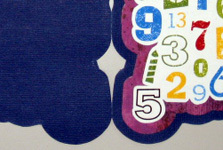 Glue the maroon cut-out in the middle of the folded dark blue card which would create an 0.25” margin all around. Using the curved edges of the maroon cut-out as guides, trace out this silhouette on the dark blue cardstock while maintaining the 0.25” margin. Cut out this drawn silhouette to create the final shape of the card. 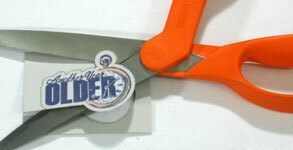 Handle the folded edge with care while cutting the final shape of this creative birthday card. This way, the card will still function like a door on hinges when you're done. Use colored pencils to paint the art. 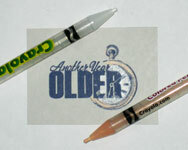 In this case, white and light-brown colored pencils worked for the watch face and watch body respectively. Use a drawing pencil to trace out a silhouette around the letter-art leaving about ⅛” margin. Cut out this traced shape. Use the shape of the pastel grey cardstock as a guide to trace out a silhouette of ⅛” margin on the dark blue foam piece. Use the traced shape to cut out the dark blue foam piece. Finally, glue this cut-out foam piece at the top right section of the funny birthday card. 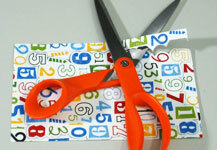 Can’t find paper with numbers art? 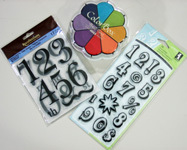 You can make your own with rubber stamps and ink pads or by various other methods and tools.